We’ve all heard that phrase. We’re looking for someone who thinks outside the box. She tends to think outside the box. Where did that phrase come from, anyway? Sounds like a job interview question. That’s because it is. In the 1970s and 1980s, management consultants challenged their clients to solve the nine dots puzzle. The challenge: Connect all nine dots with only four lines. This, of course, is frustrating to hear because the box shape becomes more apparent than ever. Now the challenged has to work at shaking away that image of the box. Why? Because you need to think outside the box to solve the puzzle. You can even solve the puzzle with three lines. The point? 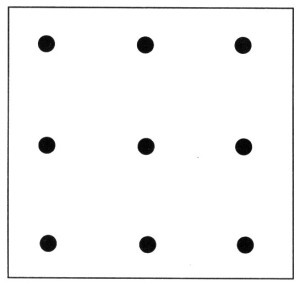 In order to solve the nine dots puzzle, the drawn lines must extend away from the box-structured dots in order to get the right angles to connect all nine with four (or even three) lines. The phrase, of course, has evolved. Now when we think of the box, we think not of the nine dots puzzle but of a solid, three-dimensional box. That box is a symbol of conventional thinking, so thoughts outside that perimeter are, well, unconventional. That’s why I don’t think outside the box. That doesn’t mean I don’t think creatively. I am a creative writer and I am a digital marketing content writer. That means I am daily challenged to make connections to unrelated ideas and use both my left brain and right brain to make a project work. This type of thinking is considered to be thinking outside the box. Why? Because there shouldn’t be a box. We don’t think in boxes. We think with restrictions based on what we’re told is right or acceptable. By giving it a shape—the box—we’re giving it permission to exist. And I refuse to accept limitations on creativity. There is a difference between procedural knowledge and declarative knowledge as well as thinking inside those realms. But instead of compartmentalizing how we think, we should approach thinking as weaving all that we know together. Because, in short, that’s what we do. So why think outside the box? I’d rather think. No boxes necessary. Do you think outside the box? Share your thoughts on the phrase below. The nine dots can actually be connected with one straight line. That’s right! Care to show my blog readers?